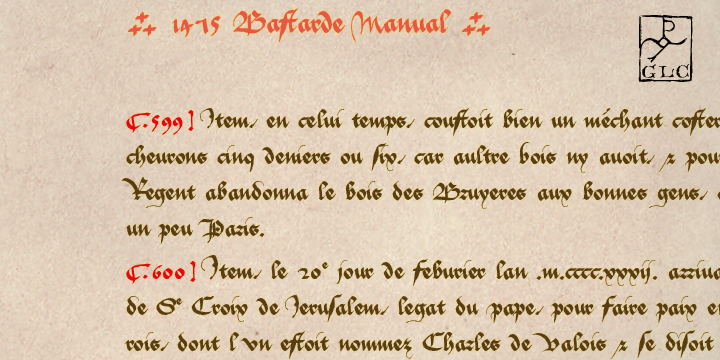 In the later stages of 1400s, Duke of Burgundy’s court used and type of fonts named “Bastarde Flamande” for hand written book. This “Bastarde Flamande” inspired the fmaily of 1475 Bastarde Manual which was drawn from the source of French Translation of Histoire Romaine book by Pierre Bersuire, circa. Characters are hand written on rough paper giving it a very polished and original look. It used few ligatures and abbreviations and is available with a file to easily identify the letters with keyboard. This text is basically associated for ancient things – may be websites or posters.